El Pinar de Campoverde (most commonly known as Campoverde) is a village set on a wooded hillside at the foot of the Sierra de Escalona mountains, 10 kms inland from Pilar de la Horadada with good views to the Mediterranean Sea. The population of 3,000 residents include many northern European residents (known as expats) living here. It is also a handy base for a holiday away from the busy coast. The translation of the name El Pinar de Campoverde, means forest and green fields. Campoverde is situated about 20 minutes drive from Murcia (San Javier) Airport and less than 1 hour drive from Alicante Airport. It is definitely best to take out car hire for Campoverde immediately once you arrive at the airport. To the south west of Campoverde is the famous Rio Seca Natural Park where you can walk along the river. There is a spectacular gorge carved by the waters over millennia through the yellow sandstone. Although a small village there are a few bars, restaurants, a supermarket and a bank. There is a small street market on Sunday mornings. Campoverde also benefits from the new Lo Romero golf course nearby. Pinar de Campoverde enjoys a typical Mediterranean climate, very hot in summer and protection by surrounding mountains against the cold north winds in winter. The area averages nearly 3,000 hours of sunshine each year and the average temperature easily exceeds 20 degrees. Much of our Pinar de Campoverde information has been supplied by locals who know the town of Pinar de Campoverde best. They have submitted their favourite restaurants and bars in Pinar de Campoverde which many tourists would otherwise miss. Here is a link to the Pinar de Campoverde town hall. Pinar de Campoverde (of the Green Field literally) is a village set on a wooded hillside, 8 kms inland with views to the Mediterranean. There are around 3000 inhabitants, many from Northern Europe. The village is situated 20 minutes drive from Murcia (San Javier) Airport and less than 1 hour from Alicante. A hire car is recommended. To the south west of the village is the famous Rio Seca Natural Park where you can walk along the usually dry bed of the river. The centre of Campoverde has several bars, restaurants, International cuisine is available, a baker, clothes shops, a supermarket and a bank. There is a small street market on Sunday mornings. 15 minutes drive from Pinar de Campoverde takes you to several beaches; with 4kms of sandy beaches stretching from El Mojon to Mil Palmeras, including a small, pretty cove at Torre de la Horadada where there is also a marina. In Lo Pagan just 10 minute drive away in the Mar Menor you have the theraputic Mud Baths for people suffering from Arthritis or any other problems, people come from all over the world to bathe naturally in those special salt baths which is totally free to the public. The larger town of San Pedro del Pinatar, with its many safe beaches on the tranquil inland sea of the Mar Manor, is 12 kms away. The resort of Torrevieja, with its fine beaches & nightlife is nearby. The nearest town is Pilar de la Horadada, with its extensive supermarkets, furniture shops & facilities including its renowned Friday evening market, is 3 miles away. Pinar de Campoverde enjoys a typical Mediterranean climate, very hot in summer and protection by surrounding mountains against the cold north winds in winter. The area averages nearly 3,000 hours of sunshine each year and the average temperature easily exceeds 20 degrees. In 1986 the World Health Organisation recommended the climate of the area as one of the most equitable in the world – neither too hot in the summer nor too cold in the winter. On average it can boast 325 sunny days each year making it an ideal all year round destination. I am very fortunate to have a holiday property in Campoverde. You can enjoy a relaxing holiday here and there are lots of places nearby to enjoy too. There is a real village atmosphere and when I go over I always get the local newsletter and free newspapers to find out what’s going on locally and beyond during our stay. This includes social events e.g. hog roasts and quizzes and sporting events e.g. walking and golf. Neighbours are wonderful at letting you know the most recent changes and giving you recommendations and directions of where to visit. The prices of food and entertainment are reasonable as they are aimed at local residents rather than tourists. If my friends or family visit they always come back and say “How did you manage to find such an ideal spot? We absolutely loved it” I do too. It’s not a place that many people have their first Spanish property as it’s not well known but I am really glad I do have. Writing this piece has made me long to return again soon. Enjoy! Colin, what would you say would be the advantages to living in Pinar de Campoverde compared to other Costa Blanca towns? Pinar de Campoverde is a pristine well-kept hidden gem set with a lush green pine-clad hillside which is far different from the Orihuela Costal resorts. Ideal for full time living and just a 10-minute or so drive from beautiful sandy beaches and the Mar Menor sea. Located on the South East coast of Spain, just 15 minutes from Murcia San Javier airport, an hour from Alicante airport and a 10-minute drive from some of the region’s best Blue Flag beaches, Pinar de Campoverde is considered by many to be one of the Costa Blanca’s hidden gems. The village is divided into two areas: old Campoverde and new Campoverde with both parts boasting a fantastic array of local facilities including a great selection of bars, restaurants, supermarkets, tobacconist, post room, a bank, two chemists, doctor’s surgery, dentists, hair salon, beauty parlour, town hall and even vets. The traditional centre of the village however, is located on the popular 2-kilometre long Avenida del Pino which runs from the main Pilar de la Horadada to Orihuela road right up to the municipal sports centre at the Río Seco. It is here that you will find most of the local amenities and during the evening, it is a fantastic place to visit as many people will sit outside one of the many bars and enjoy the warm Spanish evenings. One of the reasons that Pinar de Campoverde is so popular is due to its real community spirit where there is a perfect balance between holidaymakers and permanent residents. The village is busy all year round and unlike many of the more renowned nearby tourist areas, it is not a summer-only destination but successfully maintains its appeal 12 months of the year. Originally located next to a pine forest, hence the name Pinar de Campoverde (Pinar means ‘pine woodland’ and Campoverde means ‘green fields’), the village is now home to a variety of nationalities, however still with a very strong Spanish influence. To the southwest of the village lies the stunning Río Seco Natural Park which is famous for its dry river bed where you can enjoy picturesque walks and view the spectacular gorge. There is also a popular polideportivo (‘recreational area’) with several tennis courts, five-a-side football pitches, municipal swimming pool and a restaurant. Every Sunday there is an excellent village market which is an ideal place to buy locally grown fruit, vegetables, flowers and souvenirs. Alternatively, it is a great place to meet friends and watch the world go by in one of the street cafes. There are several outstanding beaches stretching from El Mojon to Mil Palmeras and nearby Torre de la Horadada, which is just a 10-minute drive away, has a beautiful marina and a superb beach which is ideal for all members of the family. A little to the south of the village lies the world famous Mar Menor which is best known for its 5-star La Manga Golf Resort and the array of watersports that take place within this large lagoon. There is a host of outstanding 18-hole golf courses within a 30-minute drive of the village; Real Club de Golf Campoamor, Villamartin, La Finca, Las Ramblas, Altorreal (near Murcia) as well as the legendary La Manga Golf and Country Club and a new golf course, Lo Romero, which is just five minutes away and opened in January 2008. Pinar de Campoverde is most suitable for the over 50’s but families also enjoy visiting as there are many things to see and do in the local area and the village has several excellent bars and restaurants to choose from. Many Spanish live in Pinar de Campoverde especially in the old part of the village but English is widely spoken and understood here. 1.5 kms away is the Lo Romero 18-hole golf course and the canal which is excellent for level cycling to places like Las Ramblas, Campoamor and Villamartin golf resorts plus further on can be found the Spanish towns of San Miguel de Salinas and Torremendo with its reservoir and the grand designs house at La Pedera which is open to the pulic. Lo Ruffette is a short drive away and offers paint balling, zip wires, horse riding and boating. The large Spanish town of Pilar de la Horadada is just 7 minutes down the road and has regular festivals throughout the year together with a small cinema showing English films, a Sunday market, fantastic sports facilities, open air and indoor swimming pool. Just over 10 minutes away can be found a superb selection of sandy beaches on the mediterranean coast or the beautiful safe beaches on the Mar menor (small sea). Perhaps you may like to visit nearby Cartagena naval city or the historical city of Murcia both offer tempting treats for everybody’s tastes. Pinar de Campoverde has several quality restaurants and bars and can recommend these for you to try: Portobella for sports and Sunday lunch; Maggie O’Briens for good Irish/English pub food with regular entertainment including live bands, karaoke and quizzes; Lisa’s Teas n Treats for lovely cream teas and breakfasts; Bon Pro, a Spanish-owned bar which does excellent tapas plus Italian pasta/pizza dishes with a rooftop lounge area having fantastic views to the Mar Menor sea; Crown of India, Coco Loco, Juanitas restaurant for menu del dia/pizzas; Rusty nail Irish pub with live entertainment and pub food on the main high street; that place in Campoverde restaurant, Gino’s Italian restaurant, Bombay Tandoori and the new fish and chip restaurant to name a few. In our local main town of Pilar de la Horadada can be found many top quality restaurants such as Las Caracoles, San Marino for the best slow cooked lamb around; Lorenzo’s restaurant for a good Spanish menu del dia; La Granja, Casa Araez which is our favourite Spanish fine dining restaurant having a 25 euro per person evening menu including wine and coffee to a very high standard and finally El Gallego’s restaurant with probably the best and largest steaks and seafood around. Campoverde has a couple of private doctors with a centro salud public health centre with English-speaking doctor and nurses on the main high street. There are also 2 modern chemists, opticians and private dentists in the village. In the village can also be found a tobbaconist, bakery, gift shops, Chinese stores, a mobility centre, car sales yard, church with English service on a Sunday afternoon, ironmongers, internet and TV shops, hairdressers/beauty salons, town hall, veterinary clinics, children’s play parks and supermarkets. 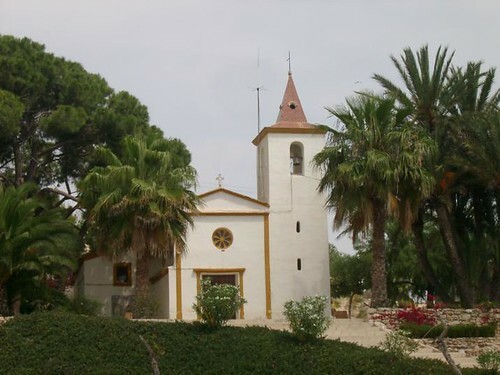 Nearby villages worth visiting are Torremendo on the shore of the Pedera reservoir, Rebate with its famous fine dining restaurant/ church/gift shop holding regular flamenco shows and El Mirador, a Spanish farmers town on the way down to the Mar Menor coast. There are several Spanish schools in Pilar de la Horadada and I believe they are all of a very good standard. No, there is a good neighbourhood watch scheme running in Pinar de campoverde with regular e-mail updates from the organiser Ray. Property prices in Pinar De Campoverde went down by almost 50% during the recession approx 15 years ago but are now showing good signs of steady growth as properties here are selling extremely well now, many selling in under 6 months from being advertised. Yes, a very good time to buy with much better value here than on the coast and in my opinion, a much better environment to live in with many properties having either sea or pine tree views. Pinar de Campoverde has three sections: the new part coming off the 1st roundabout from Pilar de la Horadada which is about 12 years now in existence; the original old part based around the high street and Rio Seco natural park and the new part around the castle. The older part has generally larger villas on bigger plots as the new villas tend to have smaller plots and cheaper prices. How much are the typical property prices in Pinar de Campoverde for apartments, villas etc? A 3-bedroom 2-bathroom quad house starts at around €100,000; a 2-bedroom detached modern style villa starts around €130,000 and a modern style detached 3-bedroom 2-bathroom villa with communal pool starts at €150,000 or with own private pool from €175,000. The older larger villas in the older section of the village start from around €200,000 and up depending on the number of bedrooms and size of plot. Any tips and advice to people looking to buy in Pinar de Campoverde or surrounding area? Please see our website for many bargain-priced properties we have for sale in Pinar De Campoverde. We will be more than happy to answer any questions you have regarding any aspect of Pinar de Campoverde or perhaps you would like a no-obligation inspection trip to allow me to show you everything in and around the area including the nearby beaches and maybe a selection of properties we have for sale that may be of interest. We look forward to hearing from you soon. Telephone Colin David on: 0034 696 021 986. Colin, thank you so much for taking the time to help our readers with your experiences in Spain. If you want to contact him, you can find his details below. Pinar de Campoverde Page Summary – This page contains unique content about the beach resort of Pinar de Campoverde, a popular tourist destination on the Costa Blanca coast of Spain. Please help us to make this the number one tourist resource for Pinar de Campoverde by adding any comments, reviews, ratings and feedback on any aspect of Pinar de Campoverde that you know about. We also welcome your photos, pictures and videos of Pinar de Campoverde for posting on our website. The Campoverde Residents Association has Open House once a week on a Wednesday Morning 10:00-12:00 in the offices alongside the local Town Hall. Perhaps you can give us a mention. Any questions – do get back to me.